First Line: Jade grabbed her companion's arm and yanked her out of the street. Jade del Cameron and Sam Featherstone are going to be married, and Jade's parents have split them up for a little pre-wedding business. Richard and Sam are going on safari while Inez is taking her daughter shopping in Zanzibar. What could possibly go wrong? I have read every single one of Suzanne Arruda's Jade del Cameron mysteries, and I've watched the series grow from rather light-hearted adventure yarns into something much more substantive that gave me a real feel for the time period and the culture. 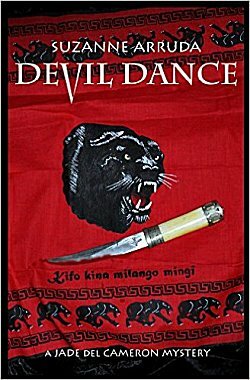 When I saw Arruda had published Devil Dance, you had to know that I snapped it up immediately. Arruda has created a good mystery with an excellent sense of misdirection. It was also a wonderful idea to split the engaged couple and pair each one with one of Jade's parents. In this way we become better acquainted with Jade's father Richard as well as Sam. Jade's mother Inez isn't as much of a mystery since she has appeared in other books. She and her daughter are so much alike that their time together can be a bit obstreperous. In addition, there are several humorous scenes as each couple begins having its share of adventures. The serious part of the book concerns slavery, and how-- although it had been made illegal quite some time ago-- some people are still involved in the sale of human beings. As I said earlier, these books aren't just light-hearted fun; the author really gives you a feel for the time and place, and this makes me enjoy her writing even more. The tension in Devil Dance grows, and it's a given that the two couples are going to wind up in the same place eventually. The only question is... which couple is going to be saving the other? If you're new to the series, I think you could read this book and not be hopelessly confused. But if you enjoy good historical mysteries with interesting characters and a vivid sense of place, I suggest you begin at the beginning with Mark of the Lion. Oh, it sounds as though there's a real sense of place here, Cathy, and I always like that. And it's nice to hear that the series has evolved into something with real substance. glad you enjoyed it. I'm happy to see that some authors whose series have been dropped have been given a new lease on life through eBooks. I read Mark of the Lion and didn't find it all that light-hearted. There was a real sense of place, as you say, and I am keenly interested in Kenya during the Colonial years. But the witchcraft element was just too strong for me to really enjoy this series. Which goes to show that no two people ever read the same book. :-) The subject of witchcraft ebbs and flows throughout the series, depending on the story. It could play an important part in life then... and now.